As we reach the half-way point in the pool stages of the 2015 Rugby World Cup, the stakes could not be higher in the so-called Pool of Death. Following Wales’ momentous victory under the lights at Twickenham on Saturday, hosts England suddenly go into Saturday’s match against fellow Pool A rivals Australia knowing it is now or never. Win and their World Cup dream is still alive. Lose and they suffer the ignominy of being the first World Cup host country to exit their home tournament at the first hurdle. Victory on Saturday would go someway to repairing the damage of the Wales defeat, however the defeat to Wales has once again raised question marks over the direction England are heading in under Stuart Lancaster. A bold selection policy that some construed as panic, Lancaster’s decision to bring in the likes of Vunipola, Farrell and Burgess for the match against Wales was vindicated in some way by solid – if not spectacular – performances by all three players. Vunipola’s energy and power put Wales on the back foot in the first half, with Owen Farrell accurate as ever from the kicking tee, while despite not making significant inroads with ball in hand the presence of Sam Burgess in midfield was enough to distract Welsh defenders to create the space for Jonny May’s first-half try. On the face of it, a 16-9 lead at half-time was reward for a solid start from the hosts against a well-drilled defensive unit. Going into the final half-hour with a 22-12 lead over their local rivals, everything seemed to be going to plan for Lancaster and captain Chris Robshaw. What followed however will surely go down in history as one of the greatest comebacks seen at a World Cup as a Welsh team stretched to the limits through injuries before kick-off somehow managed to stem the loss of two more players through injury to storm back and record a historic victory. If ever there was a moment to signify the scale of Wales’ triumph it surely must have been the sight of scrum-half Lloyd Williams – playing out of position at wing due to Hallam Amos’ injury – kicking cross-field into space for no.9 Gareth Davies to expertly pick up and dot over for the crucial try that brought Wales level, before Dan Biggar delivered a monstrous penalty from half-way to seal a 28-25 victory for the Welsh. For Wales it was sheer joy as the underdogs came away with the most unlikely of victories, while for England there was utter amazement at how they had threw away their commanding lead and in the process left their World Cup dreams hanging by a thread. In many ways, the result itself once again highlighted the difference between the two rival coaches. For Warren Gatland, the performance and result was yet another reminder of his abilities as a coach to drive his players on in the heat of the battle towards success. Having won Grand Slams and a Heineken Cup title, as well as coaching the British and Irish Lions to an overdue tour series triumph out in Australia in 2013, there are not many coaches out there with a better CV than the Kiwi. Arguably the greatest characteristic of Gatland’s coaching is the ability to get his players to rise to the big occasions, whether it be Grand Slam deciders in 2008 and 2012, a World Cup quarter-final in 2011 or the 3rd and final test of that 2013 Lions series, his sides have delivered. That ability to harness the nervous energy that undoubtedly envelops sportsmen before those defining moments, has led Wales to countless triumphs when the odds have been stacked against them and has created a team full of battle-hardened warriors who stand up to be counted at the critical moments. The performance of Dan Biggar on Saturday has been rightfully acclaimed, after the Ospreys fly-half delivered quite possibly one of the best performances from a fly-half in World Cup history. While Biggar now stands up as one of the best 10’s in the game, it is easy to forget that not that long ago he seemed a young man out of his depth at international level. However under Gatland’s tutelage, Biggar has matured and developed into a real leader within a Welsh team containing British and Irish Lions such as Warburton, Wyn Jones and Roberts. 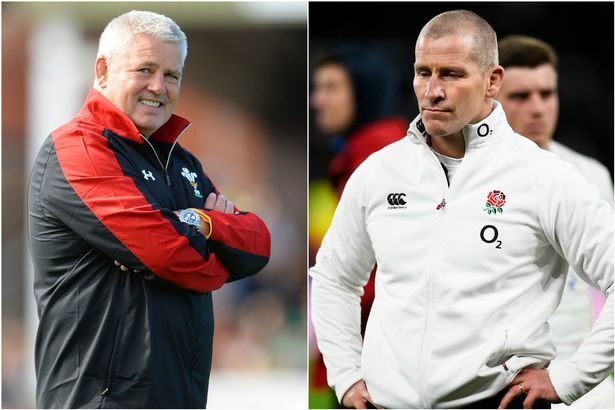 In contrast to Gatland, Stuart Lancaster’s career as England coach has been a story of so near yet so far. Plucked from relative obscurity to try and restore pride and discipline back to the England team following the World Cup debacle in 2011, Lancaster delivered with a promising first Six Nations which saw England win four of their five games as they fell just short of Grand Slam winners Wales. Victories over New Zealand and Australia – as well as a draw in South Africa – during his tenure have also been significant signs of improvement from previous regimes, as the former school teacher has instilled great discipline within his young squad. A record of 16 matches won in 20 Six Nations games, is a record many coaches would bite your hand off for, and with victories gathered in Cardiff, Dublin and Paris, Lancaster has led his side to triumph in some of the most intimidating venues in international rugby. Yet despite all this, the fact that all England have to show for in his four year tenure is a single Triple Crown title, is a reminder of the opportunities missed during his time in charge. Four second-place finishes in the Six Nations is a solid record, but also a frustrating statistic that has come to diminish Lancaster’s standing. Defeats in Wales in 2013 and Ireland in 2015, in particular have been examples when England have stood on the brink of success only to crumble in the heat of the battle. Saturday’s defeat was a stark case of Deja-vu for Lancaster as the pressure once again got to his players as they failed to close out a game they should have won. There is much to admire about the England team Stuart Lancaster has created. A team that throughout his time in charge have been difficult to beat, built on a solid pack and marshalled by the calm authority of players like Owen Farrell and Brad Barritt, adapted slowly into a team full of exciting prospects such as George Ford and Jonathan Joseph who can run rings round the best teams. Despite this however, Lancaster is in danger of being remembered as a nearly-man who couldn’t push his players over the line at the crucial moments. All is not lost for England. With Wales facing a tricky tie against Fiji, and with a good recent record against the Aussies, come Sunday morning England may well still be in contention at this World Cup, but ahead of another do-or-die battle, Lancaster knows he must deliver as a coach.